In 1888, this settlement was named in honor of Wellington R. Burt, the lumber tycoon who arranged for the Cincinnati, Saginaw and Mackinaw Railroad to run through this village. During his 1888 gubernatorial campaign, Burt donated $1,000 for the construction of a township building. Henry Youmans, also seeking an office, supplied the bricks, ironically, neither man carried the township in the election that year. Local resident Sarah A.
Miller gave the land with a deed stipulating that any structure built be used for education, social and wholesome amusements, and meetings, and public gatherings dedicated to free thought, free speech and good government. Townspeople contributed labor and additional funds for the erection of this hall, dedicated in 1891. 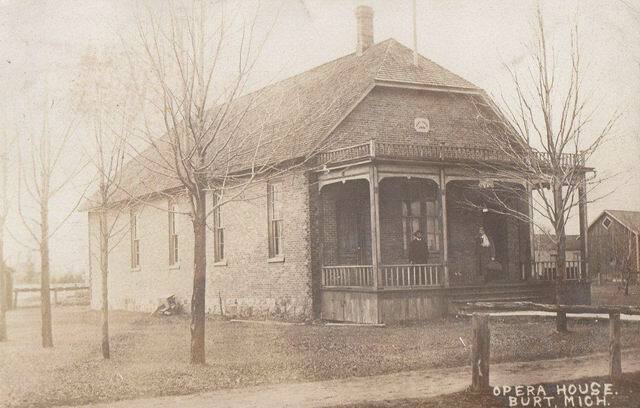 The Burt Opera House has hosted vaudeville shows, weddings, local fairs, township meetings and elections.